Wandering stars have occupied the human mind across centuries and millennia, along with the quest to explore and colonize cosmic space. Is there something in us that refuses to believe that we are alone in the universe? Does our longing for the stars conceal something different? To what extent can fiction shape future realities? The construction of such inquiries are at the centre of Marjolijn Dijkman’s work, which pivots around humankind’s fascination for cosmic space, the position of our planet in the universe, and human subjectivity in relation to celestial bodies. Radiant Matter comprises a series of recent artworks that desire to analyse and reflect on the nature of scientific inquiry, the role of speculation, fiction and spiritualism. Together with a poetic image essay and a conversation between the artist and the editor Kris Dittel, this widely illustrated book includes texts by Maarten Vanden Eynde, Ken Hollings and Raqs Media Collective. Scientific and technological inventions allow us to perceive more stars in the sky than what the naked human eye can, yet looking up at the night sky never ceases to affect the imagination. Light arriving from faraway stars long extinct, and passing comets and star constellations provide a limitless source of myth and legend; and the rare event of a sun eclipse still mobilises millions of people. The horizon of human imagination has been always larger than planetary in scale, just think of astrology: at least since 2000 BC it has been supposed that the movement and position of celestial bodies influence life on earth. Fast forward a few thousand years to when the effects of the first images of earth from space have settled in, and space settlement and the possibility of finding inhabitable planets no longer sound like a science-fiction scenario, imagination is being moved by space programmes and the whirlwind of technological development. Yet are we ready to face ourselves in this ‘large outside’? As Marjolijn Dijkman puts it in the closing sentences of our conversation: ‘If we want a better future, maybe we need better stories.’ In a dialogue titled As Above – So Below we discuss a recent body of her works that is tied together by its quest to interlink science, technology, speculation, art and spiritualism. We touch upon questions prevalent in her practice: on the role of fiction in scientific inquiry; the vital questions of humanity, such as if we are alone in the universe; and the pressing need to know, to discover and to conquer space. Several artworks featured in this publication were commissioned for the 11th Shanghai Biennale, titled Why Not Ask Again and curated by the Raqs Media Collective. 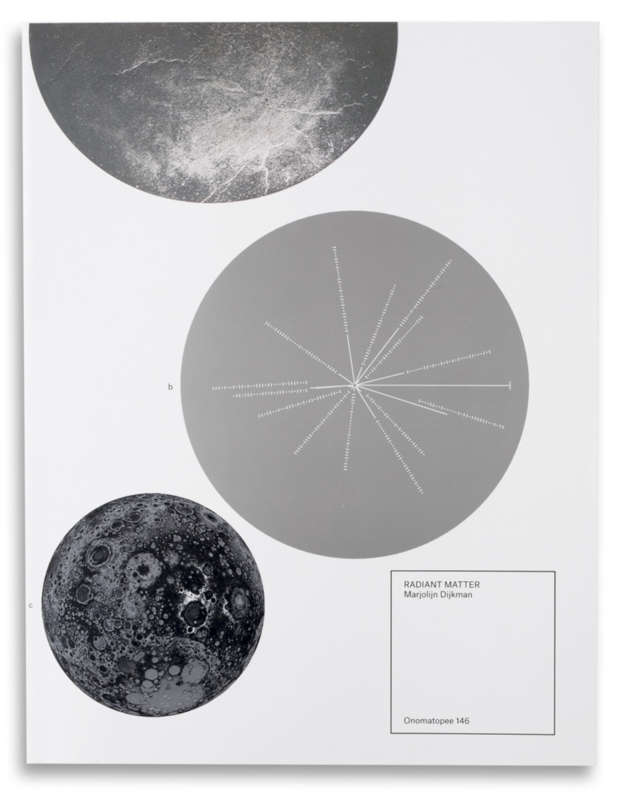 In their poetic contribution Raqs speculate on the moon’s effect on the development of human nature and remind us of a recently emerged image capturing the dark side of the moon by remote satellite. This time, ‘we see ourselves from the outside, with the moon astride us.’ Raqs Media Collective also provides a personal account of Marjolijn’s LUNÄ table gatherings that took place in Shanghai during the biennale. These moonlit meetings were inspired by the Lunar Society of Birmingham, whose members gathered between 1765 and 1813 to debate advancements in science, philosophy, commerce and art. An account of such gatherings is captured in William Blake’s satirical short story An Island on the Moon, written around the second half of the 18th century. In his contribution A Sundial on the Moon, writer and broadcaster Ken Hollings gives a thorough analysis of Blake’s story and its fictionalised characters – for instance Lunar Society member, scientist and philosopher Joseph Priestley is featured in Blake’s story as Mr. Inflammable Gas. 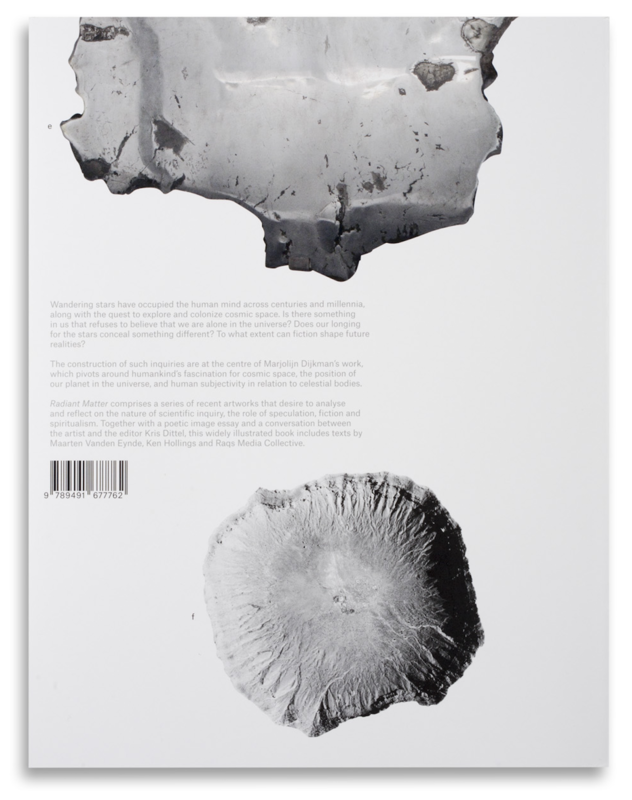 A central position in this book belongs to Radiant Matter, an edited pictorial essay consisting of over 250 images selected from various disciplines: astronomy, cosmology, medicine, technology and anthropology. Their colour composition is not coincidental; it is based on the gradient seen on scientific observations of cosmic background radiation. Since ancient times celestial bodies are thought to have had an influence on the human body, as oftentimes represented in the image of the Zodiac Man. Already in the 1800s electromagnetic waves had been discovered and some 100 years ago cosmic radiation was identified. Radiant Matter recon- figures such moments in history, scientific or spiritual in nature, in order to analyse, manipulate and revaluate their significance. Maarten Vanden Eynde’s semi-fictional speculative story Cosmic Connection outlines possible high-tech developments and human kinds’ current invasion of space. Thousands of satellites orbit the earth, and the presence of their debris in space is continuously increasing. Perhaps, in the not-too-distant future, technological development will enable not only a more expanded exploration of the universe but also the evolution of post-human bodies to a worrisome extent. The book concludes with the multi-lingual transcript from Dijkman’s film Prospect of Interception, once more bringing together areas of spirituality and science (astronomy, astrophysics, cosmology) throughout time and across cultures. The film’s narration expresses a timeless fascination for the cosmos, yet also embody a desire to colonise space and exploit its resources. Made possible thanks to the generous support of the Mondriaan Fonds.